Golan Heights, Did Israel Steal It From Syria, Aren't They Breaking International Law annexing It? Since Trump has come out and said that the US will recognize the Israeli de facto Sovereignty over the Golan Heights, we have been deluged with claims that this is just another move to expand Israel, they stole it from Syria, they have no legal right to it, but is this the truth? Turns out it is not that easily proven. To understand the ties to the land we need to go back in time. 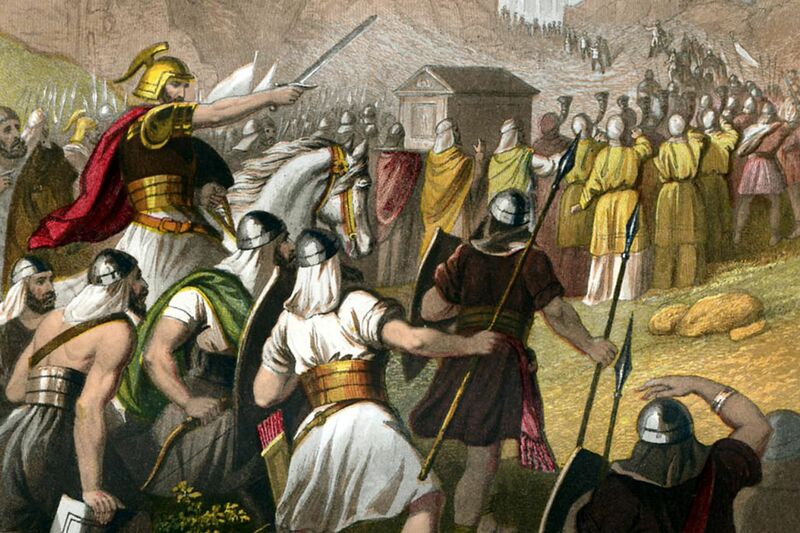 In the time of Joshua, the 13th Century BCE the Jews came into the land then known as Canaan, they conquered the land, set up area’s that each of the 12 tribes settled in, Israel was more a loose confederation of Tribes until the Kingdom of Saul unified them to a small degree, but the majority of the unification came during the kingdoms of David and Solomon, then was split it two when Solomon’s son was sitting on the throne, or so the Biblical narrative goes. According to the Bible, the Children of Israel conquered the Golan Heights from the Amorites (Deuteronomy 3:1-11). After the conquest of the land, we are told from biblical sources that the tribe of Dan and Manasseh. Since the land bordered the ancient kingdom of Syria, they as well had a relation to the land, both prior to Joshua and the conquest of the area, after Joshua was bordering the ancient kingdom of Syria, later of the Assyrian Empire, there were conflicts over the land, later ended up being the undoing of the ancient kingdom of Israel, although part survived the Assyrians with the kingdom of Judah. We now come to the modern age, this is the most pertinent to the debate, both Israel and Syria make claims to the land, but who has the stronger claim? The Golan Heights was originally part of the Mandate of Palestine, this land was to be set up as the Kingdom of the Jews, as the Mandate specifically stated, The British and French, then by totally ignoring the Mandate laws set off to redistribute land, but the catch was, the land was never theirs, they were only administrators, their job was to aid in setting up self-ruling governments, not to make the territories part of their kingdom. The original Mandate divide of the land was as the picture on the right shows. The b11oundaries set up in the Mandate of Palestine was set up as the Ottoman Vilalel had set it up, as you can see wit the furthest purple lines extended. After this, the British and French in the Paulet–Newcombe Agreement, later was called the Franco-British Boundary Agreements. The Mandatory shall be responsible for seeing that no Palestine territory shall be ceded or leased to, or in any way placed under the control of the Government of any foreign Power. The conflict with the Golan Heights came between Israel and Syria in the 1948 war, at the time, as you can see in the map above, Syria in their invasion of Israel demanded their right to keep the land they held in that war, the area’s in green, but now are saying they still have a legal right to this land, but Israel has no claim to land conquered in the war of 67. Many say that Israel was the aggressor, they attacked Syria and drew them into the war, but what no one is talking about is since the war of 48 Syria has remained in a state of war with Israel, there is no law that states they can attack, nor that the land is not able to be disputed from the earlier war but the later does not have the same protections under international law. 1856 Paris Declaration Respecting Maritime Law abolished privateering. 1864 Geneva Convention for the Amelioration of the Condition of the Wounded and Sick in Armed Forces in the Field. 1868 St. Petersburg Declaration Renouncing the Use of Explosive projectiles Under 400 grams Weight. 1874 Project of an International Declaration concerning the Laws and Customs of War (Brussels Declaration). Signed in Brussels 27 August. This agreement never entered into force, but formed part of the basis for the codification of the laws of war at the 1899 Hague Peace Conference. 1880 Manual of the Laws and Customs of War at Oxford. At its session in Geneva in 1874, the Institute of International Law appointed a committee to study the Brussels Declaration of the same year and to submit to the Institute its opinion and supplementary proposals on the subject. The work of the Institute led to the adoption of the Manual in 1880 and it went on to form part of the basis for the codification of the laws of war at the 1899 Hague Peace Conference. 1909 London Declaration concerning the Laws of Naval War largely reiterated existing law, although it showed greater regard to the rights of neutral entities. Never went into effect. 1922 The Washington Naval Treaty, also known as the Five-Power Treaty (6 February). 1925 Geneva protocol for the Prohibition of the Use in War of Asphyxiating, Poisonous or Other Gases, and of Bacteriological Methods of Warfare. 1928 Kellogg-Briand Pact (also known as the Pact of Paris). 1929 Geneva Convention, Relative to the treatment of prisoners of war. 1929 Geneva Convention on the amelioration of the condition of the wounded and sick. 1930 Treaty for the Limitation and Reduction of Naval Armament (22 April). 1936 Second London Naval Treaty (25 March). 1938 Amsterdam Draft Convention for the Protection of Civilian Populations Against New Engines of War. This convention was never ratified. 1945 United Nations Charter (entered into force on October 24, 1945). 1946 Judgment of the International Military Tribunal at Nuremberg. 1947 Nuremberg Principles formulated under UN General Assembly Resolution 177 21 November 1947. 1948 United Nations Convention on the Prevention and Punishment of the Crime of Genocide. 1949 Geneva Convention I for the Amelioration of the Condition of the Wounded and Sick in Armed Forces in the Field. 1949 Geneva Convention II for the Amelioration of the Condition of Wounded, Sick and Shipwrecked Members of Armed Forces at Sea. 1949 Geneva Convention III Relative to the Treatment of Prisoners of War. 1949 Geneva Convention IV Relative to the Protection of Civilian Persons in Time of War. 1954 Hague Convention for the Protection of Cultural Property in the Event of Armed Conflict. 1971 Zagreb Resolution of the Institute of International Law on Conditions of Application of Humanitarian Rules of Armed Conflict to Hostilities in which the United Nations Forces May be Engaged. 1974 United Nations Declaration on the Protection of Women and Children in Emergency and Armed Conflict. 1977 United Nations Convention on the Prohibition of Military or Any Other Hostile Use of Environmental Modification Techniques. 1977 Geneva Protocol I Additional to the Geneva Conventions of 12 August 1949, and Relating to the Protection of Victims of International Armed Conflicts. 1977 Geneva Protocol II Additional to the Geneva Conventions of 12 August 1949, and Relating to the Protection of Victims of Non-International Armed Conflicts. 1978 Red Cross Fundamental Rules of International Humanitarian Law Applicable in Armed Conflicts. 1980 United Nations Convention on Prohibitions or Restrictions on the Use of Certain Conventional Weapons Which May be Deemed to be Excessively Injurious or to Have Indiscriminate Effects (CCW). 1980 Protocol I on Non-Detectable Fragments. 1980 Protocol II on Prohibitions or Restrictions on the Use of Mines, Booby-Traps and Other Devices. 1980 Protocol III on Prohibitions or Restrictions on the Use of Incendiary Weapons. 1995 Protocol IV on Blinding Laser Weapons. 1996 Amended Protocol II on Prohibitions or Restrictions on the Use of Mines, Booby-Traps and Other Devices. Protocol on Explosive Remnants of War (Protocol V to the 1980 Convention), 28 November 2003, entered into force on 12 November 2006. 1994 San Remo Manual on International Law Applicable to Armed Conflicts at Sea. 1994 ICRC/UNGA Guidelines for Military Manuals and Instructions on the Protection of the Environment in Time of Armed Conflict. 1996 The International Court of Justice advisory opinion on the Legality of the Threat or Use of Nuclear Weapons. 1997 Ottawa Treaty – Convention on the Prohibition of the Use, Stockpiling, Production and Transfer of Anti-Personnel Mines and on their Destruction. 1998 Rome Statute of the International Criminal Court (entered into force 1 July 2002). 2000 Optional Protocol on the Involvement of Children in Armed Conflict (entered into force 12 February 2002). 2005 Geneva Protocol III Additional to the Geneva Conventions of 12 August 1949, and Relating to the Adoption of an Additional Distinctive Emblem. 2008 Convention on Cluster Munitions (entered into force 1 August 2010). The problem with using these laws to try to attack Israel’s claim, they deal with going to war to conquer land, but not going to war to take back what was legally yours. We see the same thing in the Golan Heights that we see in Judea and Samaria, or the West Bank, Jordan joined the war after war was first initiated by Egypt in the Blockade of the Straits of Tiran, Israel attacked in response to this act of war, this was after Egypt publicly came out and said they had put in place the blockade, Israel now had little choice, go to war or die by starvation, they went to war, Egypt lost. The act of putting place a blockade has Egypt initiating this war, contrary to popular claims, Israel did not initiate this war, they just went in and ended it in 6 days, resulting in a humiliating defeat that so scarred the Arab soul that they felt little choice but to go back to war in 73 to save face. While they lost that war as well, they put up a much better fight, thus felt they had saved enough face that both Egypt and Jordan were able to go forward with a peace treaty with Israel. The problem is Syria never signed a peace treaty, still hasn’t, thus under international war, more specifically, the Law of Conflict, states that Israel is under no obligation to cede back territory, or even discuss borders until Syria does. Why is it Syria and the Arabs, along with most of the members in the UN are demanding that Israel give back without following the letter of the law, that is, simply, not the way things work. Also, why is it that the UN is demanding Israel to hand back land conquered in 1967, but they refuse to budge on land conquered by the Arabs in 48? What we are seeing are double standards displayed for all. So what has Israel’s stance been on this? They have tried multiple times to give back the Golan Heights for peace, just like they did with Egypt, but each time Syria has walked away. On June 19, 1967, the Israeli Cabinet unanimously voted to hand back the entire Sinai to Egypt and all of the Golan Heights to Syria in return for peace and demilitarization. What was the Arab reaction to this? A position that Syria still holds, they put in place their three no’s, this was what they all came out of their meeting at Khartoum. These were: “No peace, no negotiations, no recognition of Israel.” Israel at this point UN Resolution 242 that demanded they relinquish most [but not all] “territory” acquired in June of 67. While the implementation of this took time, they handed back the Sinai, there was no claim to this land, it was never part of the Mandate. President Bill Clinton’s negotiating team sought to arrange “Land For Peace” between Israel and Syria. The United States’ lead negotiator, Dennis Ross, affirmed that in the mid-1990s, Prime Minister Ehud Barak offered to relinquish all Golan Heights territory to accord with the international border established in 1923. Nearly 10 years later, as reported on June 9, 2007, by The Telegraph [UK], an Israeli Prime Minister once again offered the Golan to Assad in exchange for peace with security. Ehud Olmert reached out to Syria only after American President George W. Bush gave the green light in an hour-long conversation. In a secret communique, Olmert’s offer of the entire Golan required that Syria dissolve its alliances with Iran, Hezbollah, and with Palestinian militant factions who maintain headquarters in Damascus. Assad wanted unilateral and unconditional Israeli withdrawal. He could not agree to any concessions whatsoever in the interest of peace and security. The bloody aftermath of Israel’s unilateral withdrawal from Gaza has disproven the effectiveness of this approach. Since the chaos of the Syrian civil war in 2011, no further Israeli offers have been possible. Assad has been ruthless, using poison gas against his own people. He has murdered hundreds of thousands of Syrians and uprooted millions. What we have seen, with the exception of Egypt and Jordan, the Arab nations seem to think they are dealing with Israel from a position of strength, which they aren’t, Israel in turn refuses to negotiate for another Gaza, so they walk away, the world then, with the UN as their mouthpiece start their condemnation. Bottom line, at this time Israel has every legal right to ever inch of the land on the Golan Heights, if Syria and Israel finally sign a peace treaty, which I think Syria has little or no interest in doing, the question of the Golan Heights will then have to be re-addressed, but that is between Israel and Syria, not the world. NextWhat Exactly Has Trump Done? Trump Administration Backing Bill to Cut off Aid To Palestinians. Justice Is Dead, The FBI Needs To Be Rebuilt, Mueller Needs To Go!